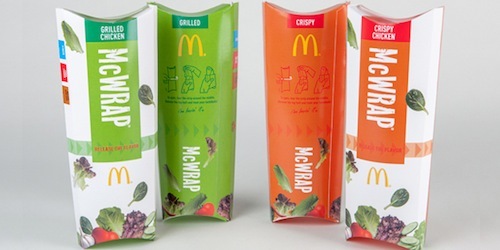 McDonald’s is making strides in a more healthy direction by launching their new Premium McWraps — a tortilla-wrapped entrée with fresh vegetables, grilled or crispy chicken breast sprinkled with one of their signature sauces: rice vinegar, sweet chili, or creamy garlic. The company recruited New York Knicks’ Steve Novak to partner up with them for the launch. I was invited to take a look and talk to Novak about the partnership, and of course, basketball. Beauty and the Feast: I first wanted to ask how you got involved with McDonald’s. When you think of an athlete, you don’t normally associate that with fast food! Steve Novak: I think that’s what’s so great about the Premium McWrap because it’s a healthy option and it’s not just a small portion — it’s an entrée. For someone like me, you go through the drive-thru and you want something that’s going to give you energy something that’s healthy: chicken, vegetables. I think that’s what McDonald’s is becoming more and more known for. That’s why they asked me to be part of this launch and I’m obviously I’m excited to be working with McDonald’s. More and more people want healthy and something more substantial, and that’s exactly what this is. BATF: What’s your earliest memory associated with McDonald’s? Novak: I remember where I grew up in Milwaukee, there was this brand new McDonald’s and they were building this huge Play Place — I felt like Great America was moving down the street! I had to be 5 or 6 years old. BATF: Were you still the tallest kid in the playpen? BATF: If you had to split a McWrap with one of your teammates, who would you pick? Novak: I would definitely split it with J.R. [Smith]! Everyone thinks ‘How can they be friends?! They’re so different from each other!’ But really, basketball brings worlds together. Maybe we’d get a McWrap but wouldn’t agree on which one to get…but you know…I’d definitely split it with J.R.
BATF: As one of the best shooters in the NBA, what are some of your tips for aspiring athletes? Novak: MY M.O., what I truly believe is out-working everybody else. When I was in 8th grade, I realized how many basketball players there were in the country and the world…I started going to tournaments and seeing how many people were playing basketball. So I set a goal for myself to make 300 jump shots every single day after school. I’m just a big believer in, no matter what anyone tells you — You’re not strong enough, You’re not tall enough, You’re not athletic enough– you can out-work all those people who are more gifted than you. I think that I’ve been able to be successful because of my work ethic. BATF: Wow, so you did that every single day? Novak: I would make 300 everyday until high school. I did it consistently for 8th grade and freshman year and as the years went on, the practices became more intense and the routine changed a little bit, but that’s what started me on a goal and routine mentality. BATF: I guess that shows hard work pays off! Novak: No question. It has a lot to do with what I am. BATF: I have to ask: where did the belt move [aka discount double check] come about? Novak: Well I’m from Wisconsin and I’m a huge, huge Packers fan. I have been since Don Majkowski was the quarterback, and then Brett Favre took over, and now Aaron Rodgers is the quarterback. And Aaron Rodgers does the belt. I’ve been such a huge fan of his that in one game last year, when we were playing against the Dallas Mavericks…it literally just came out! I don’t know where it came from, but it comes from my love for the Packers. Every time I do it, it’s kind of like a shout out to all my Milwaukee, Wisconsin people. BATF: Whose career would you most like to emulate if any? Novak: Your career really is your own footprint. But there’s so many guys you look up to and want to be like growing up, like Ray Allen who’s still in the league. The way he carried himself when he was in Milwaukee, the way he played, and just the man that he is I think is someone that I really looked up to. BATF: What’s the best part about being a Knick? Novak: There are so many! I think the best part is when I was little, to think that one day I’d be playing for the Knicks in New York – truly the best basketball city, the best arena, the best team in the world in I think all basketball people’s minds – it’s such an honor. To be part of that legacy, that tradition…it’s something I’ll forever be proud of. 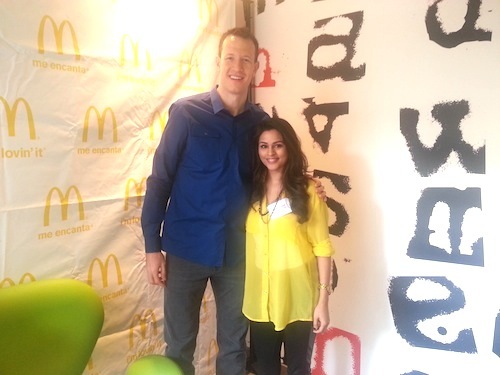 Thanks so much to Steve Novak for his time and McDonald’s for inviting me to the launch! The Premium McWraps are available nationwide at McDonald’s for $4 (each range from 300-600 calories depending on what options you get with it!). Well done cuzo! This is your best article on this blog.